Get Battlefield V pro tips on how to nail the first Chapter Event – and how to unlock a great reward. Available to all Battlefield™ V players, Tides of War is the Battlefield V live service journey which will let you continue your Battlefield V experience through seasonal events and more. And it’s starting now. Tides of War consists of Chapters spanning over multiple weeks, each with its own unique theme and gameplay possibilities. A Chapter can bring new battlefields, challenges, modes, weapons, progression options, and more to your Battlefield V experience. We’re glad to unleash the very first section of Tides of War with Chapter 1: Overture. This Chapter’s first week is ongoing between December 6 and December 12, and will be your introduction to the ever-evolving nature of the game. It comes with a new War Story called The Last Tiger, the Panzerstorm map, the Practice Range, and lots of events. Speaking of events, there will be weekly Chapter Events in each Chapter. These can be described as themed challenge trees where you choose the path, picking in-game challenges. A great reward awaits at the end of each tree. Chapter 1 will be your introduction to Chapter Events – the first one is called Attrition and Fortifications. 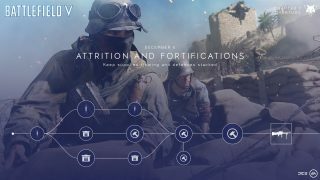 As you know, ammo and medical supplies are not unlimited in Battlefield V. Attrition and Fortifications challenges you to resupply yourself and your team in a challenge tree where you choose the path. Complete this challenge, and you’ll earn the mighty VGO medium machine gun. During WW2, the VGO was a rapid-firing machine gun developed and manufactured for use in aircraft, but later adopted for land use. In Battlefield V, it will be a great asset for suppressive and deadly fire for your Support soldiers. We really think you’ll enjoy this Chapter unlock. There are several ways you can reach the final goal and your VGO. Below, we’ll go through each challenge and give you tips on how to complete them. Note: the exact numbers related to these challenge criteria (such as “10 Fortifications” etc.) may change before being implemented in the game. Self Healing: Restore your own health with Bandages 10 times. 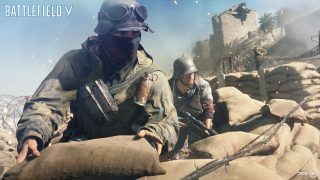 Staying alive in Battlefield V often comes down to squad play and teamwork. However, you should know that you can address your own wounds with Bandages. When you spawn, you have one of these to apply when health is low. Restock by staying close to Medics, who will throw Bandages to you, or locate Supply Stations, which are invaluable resources near bases that you can interact with to get more health and ammo. Healer: Supply teammates with Bandages 20 times. Deploy as a Medic and hand out Bandages like there’s no tomorrow! This is something all Medics can do from the get-go; simply stay close to team mates and hit the corresponding Gadget button to throw the medical gear to them. Re-Engage: Resupply Bandages or ammo 10 times at Supply Stations. Knowing your own turf is just as important as knowing enemy territory. On the control points owned by your team, know where the Supply Stations are – they will keep you stocked on health and ammo. Run up to these for a quick refill and this part of the challenge tree will soon be done. Need Ammo: Supply teammates 20 times with an Ammo Pouch. Ammo does not grow on trees, so help out your team by deploying as the Support class and handing out Ammo Pouches. Just like handing out Bandages, this requires you to stay close to your team and hitting the right button. Ammo Pouches restock primary and secondary weapon ammunition and are often godsends. Health Crate: Heal teammates for 400 health points by deploying Medical Crates. Deploy as a Medic and make sure you’ve equipped the Medical Crate gadget in the Company menu for this challenge. 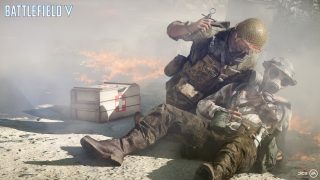 In Battlefield V, the Medical Crates let your buddies restock with Bandages (instead of creating a healing radius for those close to the crate). Break It: Destroy 10 Fortifications. You’ll be deep in enemy territory for this one. To find Fortifications, try to go for control points close to the enemy HQ. since these tend to be unguarded. Use Grenades or explosives or go for an aerial attack if you want extra distance. Ammo Crate: Supply ammo to 12 team members by deploying an Ammo Crate. Health helps you survive but ammo helps you win the day. Jump into battle with the Support class and, if unlocked, make sure you’ve equipped the Ammo Crate through the Company menu. Then drop Ammo Crates to trigger-happy Assault players, Recons who found the perfect hiding spot, or just about anyone running out of lead, and you’ll be one step closer to the final reward. Fortify Defenses: Build 10 Fortifications in friendly-controlled objective areas. Sandbags, foxholes, bridges, and Supply Stations. Buildable by all classes, Fortifications let you counter the destruction of Battlefield V and set up shop at key locations. Bring out the hammer and you’ll see outlines of where Fortifications can be built. Though this task should be done in areas under control of your team, you should still watch your back. While hammering away, you’re vulnerable – your weapons are holstered and you’re a sitting duck for snipers. Time for the “optional but fun” category. Take a break from the heat of battle and grab some cold snow on the Norway maps. Bring out your Fortification tool, look for suitable spots (we’ll leave the exploration to you), and create the battlefield’s most adorable (but least efficient) “Fortification”. Hold the Fort: Complete the last objective. The final challenge in Attrition and Fortifications requires you to use what you've learned to earn your reward. We won't spoil the details for this one, but a handy hint is that the Support class is more efficient when it comes to building Fortifications. Good luck and keep at it. We’ll be back next week for details and tips on the second Chapter Event.